I generally like TED videos, although it seems like on the issue of intellectual property, they skew towards being against IP. In this video, Johanna Blakely talks about the relatively low amounts of intellectual property law in the fashion industry – there are trademarks, a few patents, and no copyrights. She goes on to argue that the rest of the world can learn from this – i.e. they should reduce or eliminate intellectual property laws because it will lead to innovation, like it does in the fashion industry. Of course, she’s got it all wrong. The number one problem with her talk is this: she equates designers copying each other’s designs with copyright protection. In fact, what she’s talking about is more similar to patents, not copyrights. If I see an application that does “X”, and I think “I’m going to make a product just like that” — guess what? That’s totally legal. For example, if I see Quattro Pro, and think “I’ll make something called Microsoft Excel” – 100% legal. 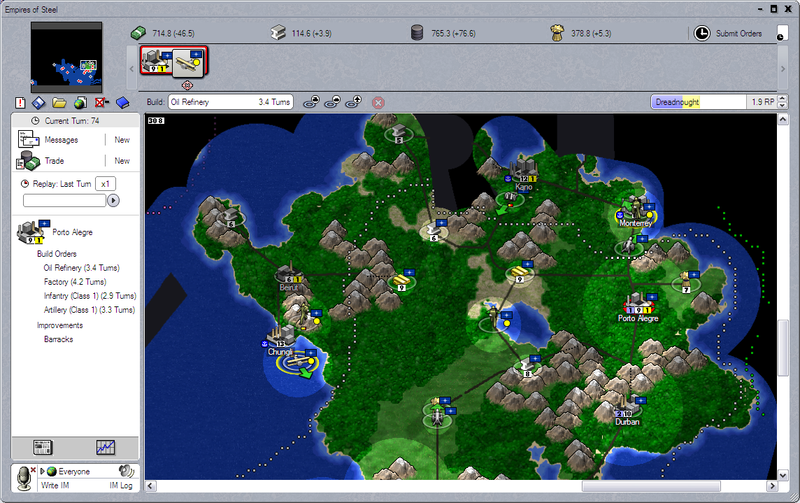 If I play a game called “Dune 2“, and think “I’ll make a game called Starcraft” – 100% legal. That’s the intellectual equivalent of a “fashion knockoff” – and it’s 100% legal in both the software industry and the fashion industry. The counterfeit customer was not our customer. Blakely: This is a very different demographic. And, you know a knock-off is never the same as an original high-end design. At least in terms of the materials; they’re always made of cheaper materials. Yup. Which is exactly why the software industry isn’t that worried about someone making a ‘clone’ of their software product — because when someone copies a piece of software, they never do it quite right, it always has it’s own personality which is different, and often inferior to the original. On the other hand, copyright is used to stop exact duplicates. Exact duplicates do not exist in the fashion industry. There is no such thing as “I pirated a copy of Microsoft Office and Starcraft, but they are inferior versions of the official versions of Microsoft Office and Starcraft.” There is no such thing as “pirated bits are cheaper/inferior to authentic ones”. So, her entire talk could really be summed up as “software patents shouldn’t exist because the fashion industry survives just fine with the existence of knock-offs”. Personally, I have no problem with that lesson. A second major problem I wanted to point out is this misleading chart. 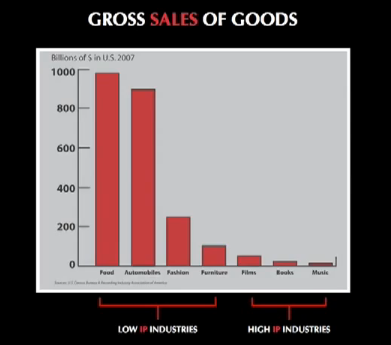 At 12:35, she shows this chart comparing the sales of “low IP industries” (food, cars, fashion, furniture) and “high IP industries” (films, books, music). He suggestion here is that lower IP protection results in more production and more revenue. That’s an interesting conclusion. There’s a variety of interpretations someone could make from that chart. Since everything in the left section is physical products, everything in the right section is digital products, maybe the lesson is that physical products bring in more revenue than digital ones. Maybe the lesson is that physical products don’t need much intellectual property protection because they’re always tethered to physical items. Or maybe the lesson is that people just don’t/won’t ever spend as much money on books, music, and movies as they spend on necessities like food, automobiles, clothing, and furniture – regardless of the intellectual property protection. I have a hard time believing that eliminating intellectual property protection would somehow cause spending on books, movies, and music to skyrocket 20 or 50 fold – so that they could rival the gross sales of the food and automobile industries. Yet, that seems to be exactly what Blakely is suggesting with this chart. Can you imagine spending as much on music as you spend on food each and every week? Here’s another little fact: the software industry, which is not shown on her chart, had a worldwide revenue of $304 billion dollars in 2008. This would place it below food and automobiles, but higher than fashion and furniture. I wonder why she left it off her chart. Update: Another problem I wanted to point out in this video is the fact that one fashion designer copies another designer, the general public is still paying the fashion industry. Now, maybe the second designer can complain about someone else getting paid for their own work, but the consumer is still paying money to the fashion industry (since both designers are part of the fashion industry). On the other hand, when piracy happens with digital media, it’s not creators copying from creators. Rather, it’s consumers getting the products for free — it means the consumer is not paying into the industry. This is another reason why the “high IP / low IP” chart is particularly wrong: because when the fashion industry has low IP protection, the consumer is still paying the fashion industry. In contrast, when digital media has low IP protection, it means the consumer is not paying money to the digital media industry. This suggests that the fashion industry would not be particularly harmed by low IP protection (as measured by the amount of revenue flowing into the industry), but revenue would decrease if digital media had no IP protection. This entry was posted in Copyfight, Copyright, Getting It Wrong, Intellectual Property, Video by Brit. Bookmark the permalink. I had exactly the same impression. The high fashion industry has a special market of people who want to show off their wealth, cheap copies have no impact on their profits. With software, I think it is more about quality. Open Office is a reverse engineering of Microsoft Office, but it’s always been much bigger and slower and nobody is spending money like Microsoft on continuing R&D to make it better. There is plenty of IP in the physical products industries too. The automobile and food industries are heavily marketed using brands that enjoy trademark and brand mark protections, and use components and manufacturing technologies that are protected by patents. You could argue that the reason they’re all so successful is because of intellectual property. Without logos and distinctive packaging, one cake looks much like another; and I’d even say many cars look pretty much alike too.